This orca whale was passing by at quite a quick pace. A killer whale will usually exhale once they are at the surface of the water which creates a plume of fine mist. However, in this case because the whale was traveling quickly, he was free to air before surfacing. This causes the water to boil above their heads and creates a film of water around the nose area giving a really nice free to air effect. 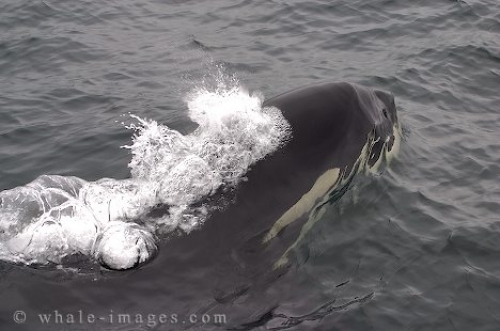 Picture of a Killer whale breaking the water surface and coming up for air.